Paddy Cunningham has been a professional Naturalist in south Florida for more than 30 years. She served as the Naturalist Manger II of Fern Forest, Secret Woods, Arch Creek and Anne Kolb Nature Centers. For the last 20 years her classes - Tools and Advanced Tools for Better Birding has focused on a 10 path approach to increasing your speed and ability to identify birds. Her birding classes Ascend to Better Birding. One of her biggest impacts on south Florida has been the restoration of wetlands and hammocks to their natural conditions from the destruction of exotic plants. Paddy has served on the boards of both Broward County and Tropical Audubon Societies and serves currently as the field trip coordinator for Broward Audubon. My motto is "You learn the i.d." and I facilitate the identification of birds in a non-intimidating field experience. I have the expertise and sharp eyes to find as many rare and number of species as any top guide, but my specialty is to patiently work with birders of all levels. My greatest joy is seeing my birders improve their skills to become advance birders themselves. As an Instructor and Top Guide it is my job to show YOU the bird, but more importantly is to teach you the special field marks, behaviors, song and habitat that is unique to each bird. My passion and enthusiasm for birding is to show YOU the bird and to teach YOU the skills to better identify it in the future. 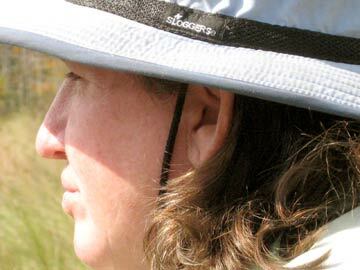 Her business, Birding Adventures, takes birders in search of Florida specialties throughout the state, specializing in the Everglades, Big Cypress, Corkscrew, central prairies, Ft. DeSoto and the Keys. Successful trips to Panama, Costa Rica and the Eastern Shore of Virginia have been added to her annual schedule of trips, with future trips to Grand Bahamas and Jamaica. More than 250 species of birds are found each year on her Florida trips. Paddy is a very popular public speaker, presenter and field trip guide at birding festivals: Space Coast, Big "O", and Wings and Wildflowers. She has been published in the Florida Naturalist. In 2008, despite working full time as a Gifted Science teacher, owner of Birding Adventures, wife and a mother of teenagers, Paddy took on the arduous task of doing a BIG YEAR as a member of the American Birding Association. Paddy placed 1st in Florida with 333 birds and 20th nationwide in the lower 48 states. 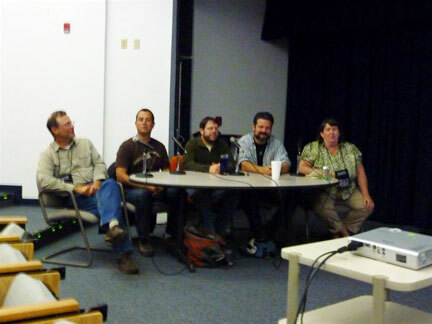 Recently, Paddy was asked to sit on the Expert Bird Forum Panel at the Space Coast Birding Festival with Jeff Gordon, President of the ABA, Alvaro Jaramillo, author of Birds of Chile, Michael O'Brien, co-author of the Shorebird Guide, and Paul Lehman, a contributing author to the Peterson Field Guide. Paddy is now the Festival Coordinator of the Everglades Birding Festival held every Martin Luther King weekend in mid January in the Ft. Lauderdale area. 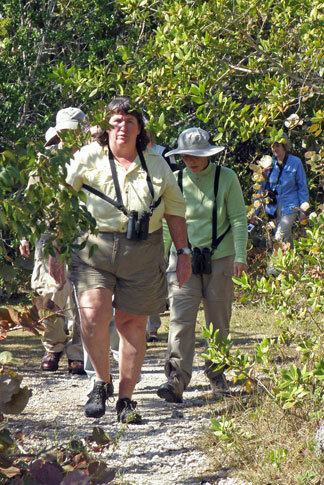 This smaller and more workshop orientated festival takes birders to Everglades National Park, Upper Keys, Corkscrew, STA 5 and South Dade for exotics, finding more than 150 species during the weekend, while birders gain advanced identification skills. (www.evergladesbirdingfestival.com). Paddy is proud to serve as Florida's Ambassador for the American Birding Association, promoting the fun of being a birder and the importance of using birding ethics while birding at various festivals and field trips. Birding Adventures has been in business for more 15 years. As a County Park Naturalist/Manager of 20 years, I realized I wanted to take interested birders throughout Florida and the world, not just local parks. So Birding Adventures was born with an emphasis on teaching birders the whys and how of identification, not just I finding the bird and you checking it off. People who bird with me gain life birds and learn the habitat, behavior, field marks and how to identify it again. I am a patient teacher and can work will birders at all levels. People always asked how am I able to find these birds? It comes with years of gained knowledge, a keen eye, a sharp ear and patience to wait for the birds to appear. I have also been told I that I should change the name of my company to "Bird til you Drop." I will work from dawn to dusk (and in the dark for Owls) to find every possible bird to add to a daily list. My birder say can I put my binoculars away? I say it's not over until its over. JOIN ME FOR A BIRDING ADVENTURE!!! WHY ARE YOUR TRIPS SO MUCH CHEAPER THAN VENT OR WINGS? WILL OUR TRIP BE AS GOOD? WILL I MISS SOMETHING BY NOT PAYING UP TO $1000 MORE FOR THE SAME TRIP? I PASS THE SAVINGS ON TO YOU BY NOT HAVING A FANCY OFFICE, SECRETARY, & GLOSSY MAGAZINE? YOU WILL BE WORKING DIRECTLY WITH ME AND THUS SAVE. Upon reading these companies itineraries and bird lists MY TRIP sometimes exceed their list and in fewer days (depending on weather and habitat visited). We usually stay in the same or comparable accommodations, with the exception of some lodges (all inclusive) to keep cost down. My LOCAL GROUP TRIPS ARE INEXPENSIVE BECAUSE MY BIRDERS GO WITH ME OVER & OVER AGAIN. I WANT TO KEEP THE COST LOWER TO REWARD THEM. THANKS!!!! 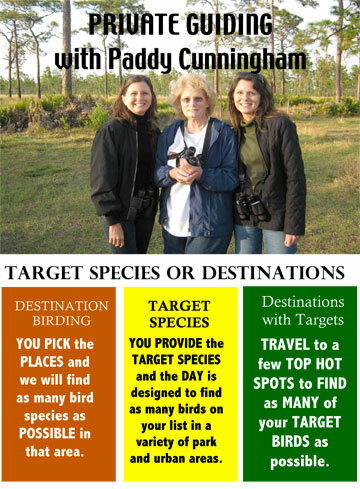 tours that target species or destinations. "You treated us like Royalty and your energy and passion sparkled throughout our weekend." You are the best birding instructor I have ever had. ever imagine-every outing a great adventure. Thank you so much for your generous lessons and for sharing your staggering knowledge with us. We all had a great time. I know I imposed upon you a lot about other things as well as birds (snakes, plants, etc..) and I appreciate your patience and good humor. Thanks for the great birding adventure in Virginia. I had a great time and learned so much. I can’t wait for the next trip! Dr. Patty Born "It was great to see another professional put the art of birding together so well." "You were a big hit with the attendees of the South Regional American Birding Association Conference. We couldn't of done it without you." — Chip, Assistant Coordinator of Events and Conferences A.B.A. "An outstanding guide and instructor"
"You are a gifted field trip leader. Florida is lucky to have your birding by ear skills." "I love your passion and enthusiasm for birding." She has been doing that all day." “Excellent, well organized and very educational trip. The leaders were phenomenal, so knowledgeable and observant. Great personalities.